We are pleased to announce some of the most intricately detailed work we have done yet has now launched! Sugar Blue Burlesque is a performance troupe and a burlesque academy that was established in 2007. They have a great looking brand identity and fabulous photos but their previous site did not show this. Clever Starfish worked with the director of the company Melanie Piantoni (aka A’dora Derriere) to rejuvenate and responsify the burlesque websites as well as being able to better manage the addition of shows, products in the store, performer profiles, academy classes and blogs. 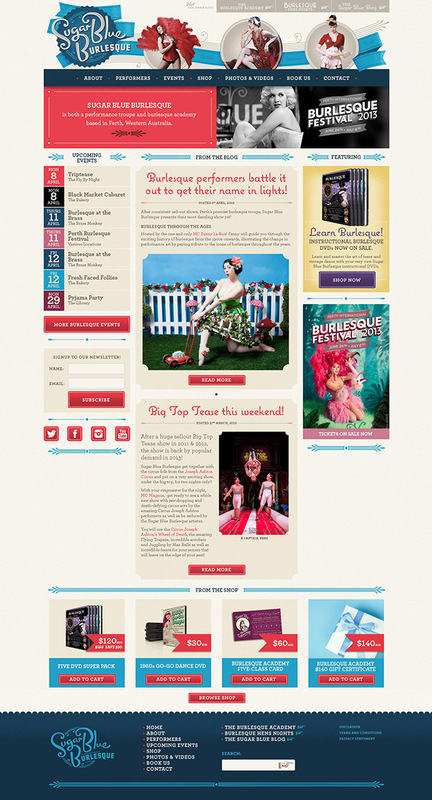 Our solution to managing all of the things was to split Sugar Blue Burlesque’s offerings into three sites. These sites were all built on WordPress and our custom catalogue/e-commerce platform Tentacle for store products and academy courses. The sites have been designed and developed to provide a user experience with subtle animations, punches of colour and detailed imagery – Refresh the home page to see the girls in the header change! The Sugar Blue site really showcases the talent behind Sugar Blue Burlesque which includes some internationally recognised performers. We have developed glamourous profile pages for each performer that shows off their videos and photo gallery, linked to all of their performances, latest blog, tweets, courses and acts they are associated with. Have a look yourself at the lady in charge of Sugar Blue—Adora Derriere—and see what acts she performs in. Sugar has a gorgeous new shop featuring products made locally in Australia and in Europe, including items designed exclusively for Sugar Blue Burlesque. Need a gift for someone who has everything? Do they have a Sugar Blue Burlesque voucher? No? We didn’t think so. You can buy them to use in the shop and for academy courses right on the site. Want to know the ins and outs of what has been happening in Sugar Blue? 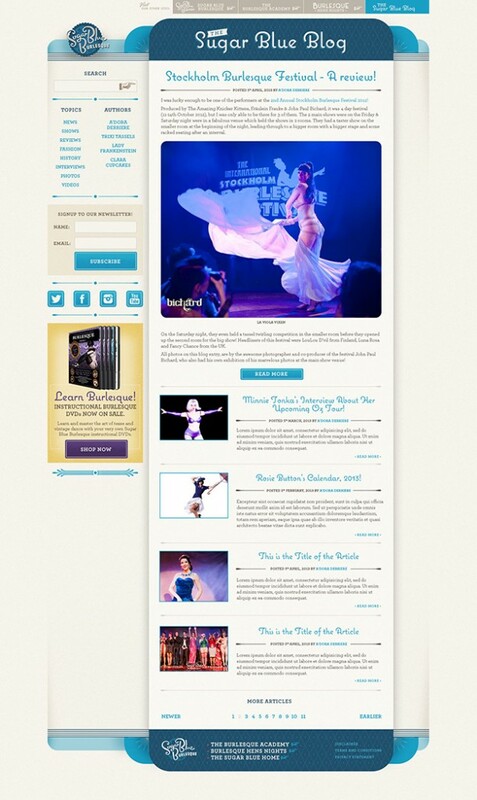 Have a look at the blog and browse by topic or Author to see what your favourite Burlesque star has been talking about. Ever dreamt of being a burlesque star yourself? The Burlesque Academy offers a huge selection of courses to get you shimmying, shaking, undulating, bumping, grinding, wiggling, jiggly twirling and swirling through classic burlesque moves. Be a Burlesque megastar for the day by enrolling in one of the many burlesque make up classes where you will be transformed into a vintage pinup in the morning for a professional glamour photography session in the afternoon. Use the filter to find the course that suits you. You can filter by course type, location, course name, location, teacher and course level. There’s a whole lot going on in this site…take a look around and let us know what you think!